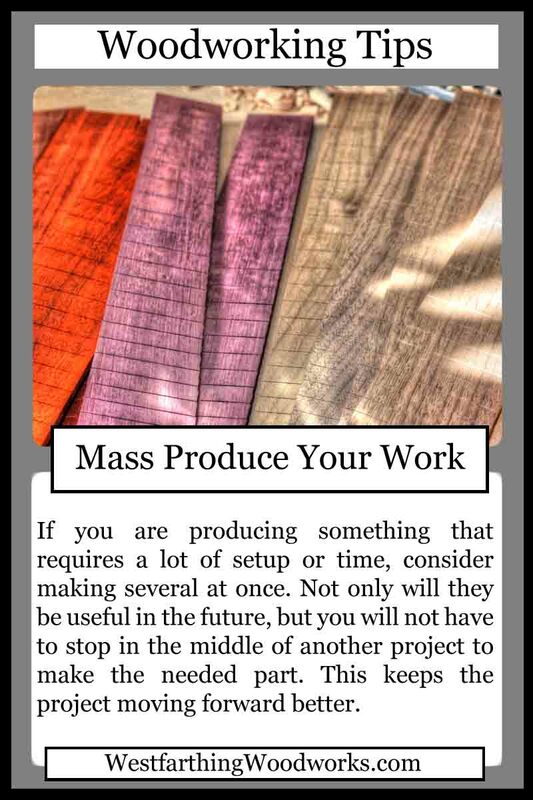 This woodworking tips card is about how to mass produce your work. This is a little different than just cranking out several projects. 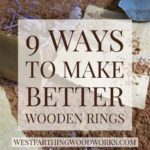 The trick here is about making several of something when you know that you will need them in the future. Here is how. At some point you may have a project that requires parts that take a long time to make. I make guitars, and the parts can take a while. Even though all I need to do is glue a bridge to the guitar, it takes a while to make, shape, and finish that bridge. The fretboard is another example. Cutting 22-24 slots in perfectly placed locations, one at a time, by hand, is time consuming. All I really need is a fretboard, but there are a lot of steps I have to perform before I can use it. 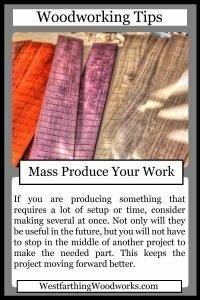 This is where mass producing your work is a great practice, and it can save you time on your projects. 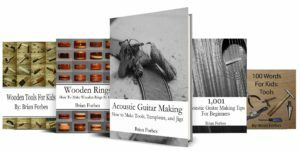 When I started making several fretboards at once, and making several bridges at once, it really changed my flow. Having parts ready to use is really nice, because you don’t have to stop what you are working on to fabricate something else. Even though it’s all part of the same build, stopping the momentum can have a negative effect. When you are going along really well and something unexpected comes up, it can destroy the momentum that you have going. 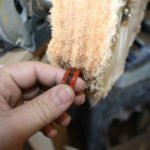 This can be really draining, especially if you are already thinking about heading out of the shop. 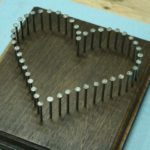 A piece that takes a long time to make can also keep you out of the shop for a while, because it’s a large psychological burden to overcome. The whole time you may be thinking that you don’t want to tackle all of that in this session, so you pass for a while. 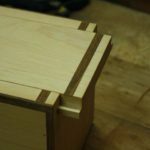 Over time, the perceived burden of making the piece or part overtakes the build, and some times you may not go back and finish for a long time. If you are this kind of person, do yourself a favor and start producing these parts so you have them on hand. 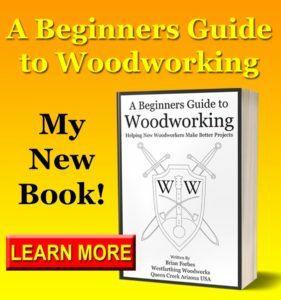 In short, the parts that you should be making several of in your down time are any that require a long process to make. 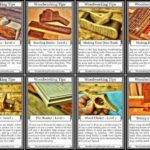 The point of this technique is to shorten the time it takes to complete a build. Parts that take the longest are priority. Another thing to consider is that the parts can be made independently from the main project without any problems. Some things, you just have to do in process and you can’t make them away from the main build. Others you can, so focus on those. Create your list, and then start making those parts when you have free time. Work on them when you have no other deadlines. The less stressful you make the task, the better the pieces will turn out, and the better they will function when you need them.